by Kaplan, Jack M., Warren, Anthony C.
Kaplan, Jack M., Warren, Anthony C.
Launch this year's most important new venture--your entrepreneurial career! Few things are more exciting and challenging than starting your own business. But before you can go public, you'll need practical skills and real-world experience. That's why Jack Kaplan and new coauthor Anthony Warren take a highly applied approach to entrepreneurship. In Patterns of Entrepreneurship, Second Edition, the authors involve you in real cases, allowing you to think through various aspects of launching a new business, just as if you were running the company. They present key issues from a practitioner's point of view, and equip you with the skills, tools, and framework you need to succeed. Now revised, their Second Edition includes four new chapters: Chapter 5, Financing the Closely Held Company; Chapter 6, Equity Financing for High Growth; Chapter 8, Business Models; and Chapter 12, Communicating the Opportunity and Making a Presentation. Key features A Focus on Real Entrepreneurs. Examples and case studies demonstrate the problems and solutions that real entrepreneurs have encountered in their own businesses. A Clear Road Map for Success. The book's road-map framework identifies practical tasks that you will accomplish as you work through the four stages of entrepreneurship: starting the venture, financing, implementation, and launching entrepreneurial businesses. Opportunities for Practice. Examples and exercises provide you with opportunities to apply skills before actually launching a business. Insights from Experienced Entrepreneurs. The authors share the experience and wisdom they gained from launching their own successful ventures. Extensive Supplemental Material. 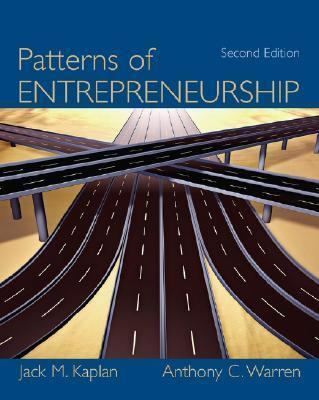 Additional cases, audio interviews, demonstrations of financial concepts, sample business plans, and legal documents are all available on the book's website.Kaplan, Jack M. is the author of 'Patterns of Entrepreneurship', published 2006 under ISBN 9780471737506 and ISBN 047173750X.